New Spice is a premium odor counteractant that encapsulates odors immediately upon contact. New Spice is not a masking agent as it eliminates odors permanently by attacking the chemical structure of many offensive odors. 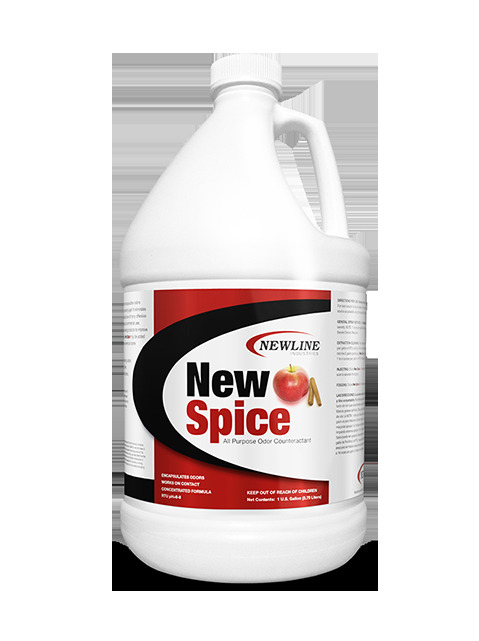 New Spice is formulated for institutional and commercial use. New Spice may be added to any residential or commercial cleaning product to improve air quality thus improving the cleaning system. New Spice can also be ULV fogged, injected and used as a post spray. A great fresh scent of apple and cinnamon. New Spice is recommended for use on the following odors: urine, pet, smoke, mildew, bacteria, vomit, skunk, airborne malodor, sewage, trash, organic, sulfide and more! Encapsulates odors and works on contact. General Spray Method: Dilute 1 - 16 oz. per gallon depending upon odor severity. Note: 1 oz. per gallon dilutions require no rinsing. 16 oz. per gallon dilutions are for severe chronic malodors. Extraction Cleaning: For portables dilute 0.5 - 2 oz. per gallon. For truck mounts dilute 10 - 16 oz. per five gallons. Add directly to pre-spray at 1:4 oz. per gallon. Injecting: Dilute 16 oz. per gallon. Saturate thoroughly. Fogging: Dilute 8 - 16 oz. per gallon. Fog as directed.